Hang on, I thought this was a Quaker blog, what’s Zen doing here? Well, let me attempt to explain. As you might have picked up reading this blog (assuming you have been), I’m interested in learning about other faith traditions, especially in understanding what it feels like to be part of the tradition, rather than just book learning (though that has its place). In January 2006 I went to Charney Manor for a weekend retreat entitled ‘Exploring Stillness (Quakers and Buddhists)’, which became very much a turning point for me, not least because I came away with the burning question ‘what ways into stillness work for you?’. I identified several possibilities that I felt warranted following up, among them circle dancing and mindful walking. Over a period of time I availed myself of opportunities to learn more about these various possibilities. This led to my going to Claridge House for the first time (which led on to other things, but that is another strand in my story). It also led, via the poetry of Rumi, to my taking Chi Gong classes for several years (but that too is part of another strand). And, eventually, it led to my joining a ‘Being Peace’ retreat at Woodbrooke in December 2009, as my final short course on Equipping for Ministry. ‘Being Peace’ was a retreat practising in the tradition of Zen master Thich Nhat Hahn. I really liked the sitting meditation, both guided and silent, and, even more, I liked the walking meditation. I wanted to learn more. 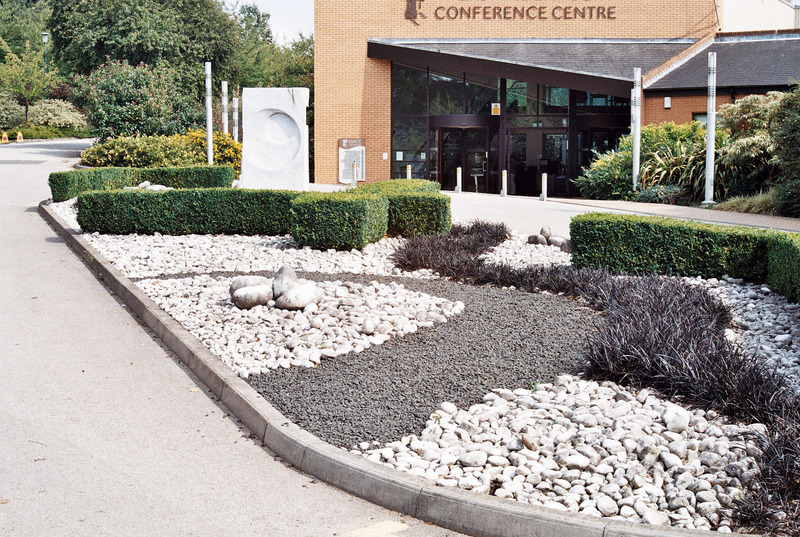 I took a follow up weekend at Woodbrooke in March 2010 and booked for the retreat that Thich Nhat Hahn was to lead at Nottingham the following August. Nottingham was initially a bit of a culture shock. I hadn’t taken in quite what it would feel like to be part of such a large group of people who did, actually, all file in for their first meal together in silence, and sat and ate it, in silence. It did seem very strange not to greet people, not to swap names, not to share something of about our journeys or talk about the weather. Quite disconcerting. Later we all assembled in the huge hall of the conference centre, renamed the Dharma Hall for the duration of our retreat. I don’t remember much of what was said that evening, except that it included fairly routine information about what would happen when. What I do remember, absolutely distinctly, is hearing Thich Nhat Hahn say ‘the Kingdom of Heaven is Here and Now’. My immediate response was that this was what I’d believed for many years, if this was what he was teaching, I’d follow. Another evening we had a presentation about the ‘Five mindfulness trainings’ and five people spoke about how receiving the trainings had affected their lives. I’d never thought of formally receiving the trainings before, but I came out of that session thinking that the trainings, although expressed rather differently, ask exactly the same behavioural changes that Advices and Queries do. Perhaps I could receive them. Despite my daughter’s best efforts to dissuade me, the final morning of the retreat found me prostrating myself, along with 100+ other applicants, in a very unquakerly ceremony to formally receive the five mindfulness trainings. It felt to me that I was making a very strong commitment to this path, although I was equally clear that I was in no way ceasing to be a Quaker. So it is very much from my Quaker home, and by following what I have understood to be ‘the promptings of love and truth’, that I have come to be following a Zen path alongside my Quaker one. This is particularly pertinent at this concluding stage of my Quaker alphabet, not only because Zen begins with Z (though obviously that helps a lot), but because I propose to attempt a Buddhist alphabet next year. It will I expect be very much a Quaker Buddhist alphabet, because that’s where I’m coming from, but I hope it will be a good continuation of the spiritual discipline that writing the Quaker alphabet has been. I wasn’t going to write about Z for zzzz, but then I caught myself nodding off in meeting for worship today and thought that perhaps I should. It was midweek meeting, which we hold at lunch-time, never my brightest time of day, and I’m not very well at present, so there is may be some excuse for my taking a nap during meeting. But does it matter? Some people I know won’t come to meeting any more. They say ‘I only fall asleep, I won’t come’. I’m sad they don’t come, they wouldn’t sleep all the time surely, and anyway, does it matter? In a way, yes it does matter. We come to meeting to be aware of the Presence, to listen to the Divine, to align ourselves more closely with the will of God, or however we describe it. Generally, our experience suggests that it is easier to achieve this if we are relaxed but alert, comfortable but aware, still but awake. We want to be conscious of what is happening in the silence. Someone who falls asleep may worry that they will disturb others. They don’t usually, although people will be aware that someone is sleeping (and I think that in most meetings of any size someone probably falls asleep most weeks). Of course, if someone snores that can be quite a distraction. Often a Friend sitting near a snorer will be able to give a gentle nudge and awaken them. If someone is really tired, it maybe that sleep is what they most need. If they take heed of the advice to come to meeting even when they “are angry, depressed, tired or spiritually cold.” A&Q 10 then it maybe that sleep is a gift to them from the meeting and from God. Today, when I caught myself dozing, I just held the sleepiness in the light, accepted that I would be forgiven, and attempted (not entirely successfully) to remain alert for the remainder of the meeting. Yack(ety-yack) – trivial or unduly persistent conversation. Concise Oxford Dictionary. We Quakers do like our silence, but when we stop being silent, you should hear us. Sometimes we do sit quietly after meeting for worship and are reluctant to break the mood, but more often everyone seems to burst into frantic conversation, yackety-yackety-yack. Over refreshments after meeting there can be a hubbub of chattering that can be very off-putting to anyone who is not part of it. They may feel ‘not part of it’ because no-one comes to speak to them, because they are a newcomer, because they find this particular sort of social situation difficult. Sometimes people are rushing around trying to speak to a list of people about various committee tasks and other, very worthy, Quaker business. Others will be talking about the weather, or yesterday’s football match. Those not involved may feel bombarded by the noise and busy-ness. I’m not actually saying that any of this is wrong. It’s good to talk, I like to talk myself. It’s good to get to know one another in the things temporal, as well as in the things eternal (Advices & Queries 18). It’s good to discuss some things face to face and when we are in the same place at the same time it may be an ideal opportunity. But it may not be the right occasion for some of our busy-ness. Please, Friends, try to be aware of those who are new, those who feel left out, those who can’t cope well with standing to chat or fetching their own coffee, those who want to ask deep, important questions about meeting for worship or other spiritual matters rather than discussing trivia. Maybe you are the person who can do something to improve their experience, rather than just joining in with the yackety-yack. 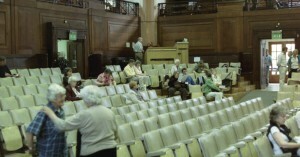 I love to go to Yearly Meeting. Arriving at Friends House, or on whatever campus we are visiting, and spotting familiar faces, greeting Ffriends, talking to Friends I haven’t met before. And then assembling for our meetings for worship for business. Unusually for a Quaker meeting, we tend to chat as we assemble for sessions, but it is helpful to have introduced ourselves to those we are sitting near before we settle into worship. As the clerks or elders enter and take their places, silence descends promptly like a blanket covering us all. The discipline in Britain Yearly Meeting is good, it has got better over the years I have been attending, and is often superb. Our local meetings could learn much. It is necessary with such large numbers to be very disciplined, but it is also possible. It is also possible, though sometimes it has been doubted, to have a flexible agenda and be open to the movings of the Spirit, in a very large group as in a small group. It is hard to explain to my work colleagues what I do at Yearly Meeting. We (all 800 or 1000 of us) sit in a big room, in silence, for 2 to 3 hours in the morning and listen, and consider some important business. Then in the afternoon we do the same again. Somehow they don’t feel it’s the most exciting way to spent a bank holiday weekend, preferring to have long lie-ins; or go to the DIY store and put up shelves; or have all the family round for a big meal. But to me, the depth of worship in the sessions; the calm way we consider the business; the deep sense of being led and the occasional excitement at times when the Spirit moves us to a dramatic, unexpected decision draw me back year after year. Added to this are the chances to go to special interest groups and learn more about some aspect of Friends’ work; or to share something that I am particularly interested in; or to sit and chat informally over sandwiches or a meal, in the Friends House restaurant; in the lawn in the garden on Euston Road; or in the refectory of a university hall, catching up with old friends or making new friendships. 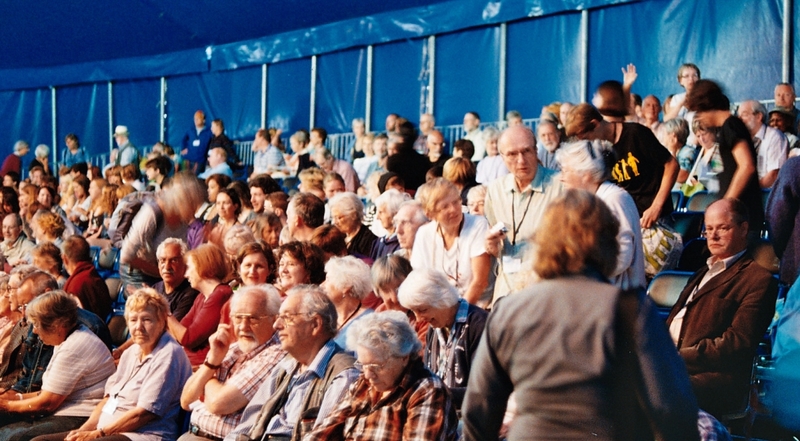 Yearly Meeting can be an overly busy experience and we all have to learn to pace ourselves. This is especially so when we meet residentially as we will next summer. 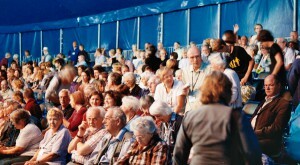 Yearly Meeting Gathering will take place August 2-9 at the University of Bath. 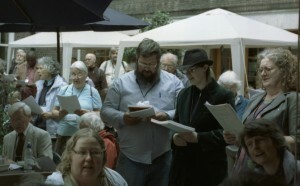 The gathering elements provide plenty of choice of activities for non-Quaker family members to participate in related activities without attending business sessions at all. They also provide additional choices, even temptations, for those, like myself, who choose to prioritise attending business sessions. Will you be joining us at Bath in 2014?